Despite issues ranging from the serious to the hilarious, EA reckons the launch of Star Wars: The old Republic has gone swimmingly. The long-awaited MMO has clocked up over one million subscribers as of last week, with market analysts putting its peak user concurrence at around 350,000. The launch hasn't gone entirely smoothly, however. 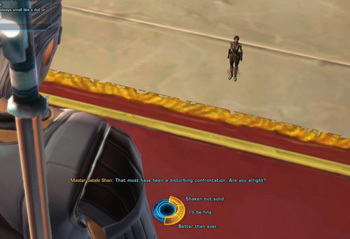 Players have had to suffer through numerous bugs, ranging from serous performance issues and missing features, to Jedi-pixies and immortality-bestowing dance routines. In an interview with Industry Gamers, EA Chief Operating Officer Peter Moore said he couldn't be more pleased with the launch, minuscule-Jedi or no. "I was watching every hour of every day because a lot of the work we needed to do in Customer Experience reports directly to me - even though BioWare handles its own customer service as you probably know. But look, there's a reason it's an MMO; it's a massive game and when I think of all the MMOs I have seen launched I can't think of one that has been launched flawlessly. There's so much you don't know and when you've got a million people coming in and playing, I'd like to be able to guarantee a completely flawless experience from a technology perspective, from an interaction perspective, but again I look at it every hour and when we look at the queue times to get on the servers, the amount of downtime that is scheduled, it's green lights all the way. I couldn't be more happy. We're only three weeks in since the launch and we're stable, we're robust and adding people. It was a wrapped phase up, and we made sure for the people as they came in that they had a great experience. Was it perfect? No. Did anybody really expect something of this magnitude and complexity to be perfect? No, but the key is how you resolve those problems and move on quickly and I think our teams have done that well." While I expect MMO launches to be buggy, I did wrinkle my snobby, PC-gamer nose in disgust when I realized the game had launched without an anti-aliasing option.